One of the greatest pleasures I have while I am summer salmon fishing is observing the habits and behaviours of coastal wildlife. I have learned over the years that every species of wildlife, whether flying or aquatic, has a direct bearing on my angling success. Gulls and sea birds help me find the elusive salmon schools, while baitfish schools, structure and water conditions, help me focus on the area where I am fishing. 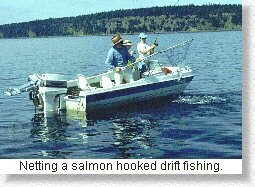 Drift fishing is the classic salmon fishing method for the observant salmon angler. Successful use of this method means that the angler is in harmony with his environment. Bird activity, particularly the smaller 'Coho gulls' (Bonaparte's Gulls and Mew Gulls) are under constant observation. Their every movement dictates where the angler will move next. (Drift fishers always carry binoculars in their boat to increase their visual reach) Tides have been carefully checked before the angler takes to the water and their shifts, ebbs, and hourly condition focus the angler's drifting/angling locations. Baitfish are being constantly located for they are the 'magic' decoys that concentrate the salmon. When all combine successfully the action can only be described as fast, furious and almost frightening when ferocious feeding salmon strike and bow the sensitive rods used by drift fishers. To the uninitiated, drift fishing is often referred to as 'jigging', often in a demeaning tone. Nothing could be farther from the truth. Yes, while it may appear to the unobservant that the drift fisher does nothing except 'jig' his line up and down (and catch fish), the skills of the drift fisher are highly developed. Drift fishing is not a new method of sea sports fishing, in fact its origin likely go as far back as the early Norsemen who 'jigged' leaded lures for cod in the Atlantic ocean. In earlier times, in the Pacific northwest, these 'jigging' lures were also used for cod fishing and proved to be highly effective for rockfish, halibut, ling cod and other sea fish. But, it was not until a few experimental sports fishermen realized that Pacific salmon also found these weighted lures attractive that we now find ourselves inundated with the current overabundance of weighted lures. Do they all work? Yes, in varying circumstances I have yet to find a drift fishing lure that will not hook a salmon. But, as you would expect, there are major differences in quantity of salmon hooked and in overall effectiveness. 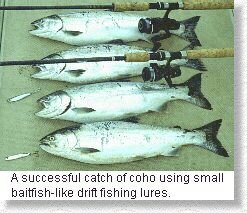 Early last July while drift fishing with friends, we found a school of feeding coho which would only actively strike at a bright pink and white minnow like lure in the 28 gram size. However, location was also critical! The coho school could only be found at the edge of the sheer drop on an underwater shelf. Whenever we moved or 'drifted' beyond the drop the strikes would stop. I marked the specific location with small brightly coloured buoys, a highly effective indicator I now use after many years of drift fishing, and we had high quality fishing. We drift fished this precise location for three days and then were blown off the water on the fourth day when a smallcraft southeast wind blew up in the Gulf. On the fifth day we returned to the exact same location, and, while the salmon were obviously there, judging from the jumpers, they no longer showed any particular interest in the bright pink and white lure which had been so effective on the previous days. Experimenting with a number of other drift fishing lures also produced few strikes until I switched to one with a silver colour. It was almost like magic how the coho came once again. Was it the colour change, the recent wind and storm, tide changes, or a new migrating school of salmon? We fished the same location, used the same methods, and made a point to be at the same tide periods but, the change in lure choice was very obvious. As the summer progressed I continued to have success with this colour and now feel that it was successful because it mimicked the salmon feeding change to herring. Drift fishermen are sea hunters! They do not stay in one location for any length of time unless they have found salmon. Over the years I have found this hunting method highly effective because it has made me attuned to the habits of salmon and the daily changes in the ocean. Repeatedly moving from location to location until I find salmon has broadened my appreciation for tides, flotsam, sea birds, gulls and salmon feeding locations. As I mentioned previously, it was not only the lure but the precise location which determined whether or not I was to get fish strikes. These locations are the 'fishing holes' where we often see concentrations of sports boats. But, and this is critical, there are what I like to call 'fish trails' just like game trails, coming from the depths near these 'fishing holes' which coho and chinook use. Drift fishing over these 'fish trails' when salmon have begun to feed on baitfish in the late spring and summer is a sure bet for success! Drift fishing and other fishing methods like trolling or bucktailing are not compatible. Each is a specific method which requires specialized equipment and a different approach to catching salmon. Can you troll drift fishing lures? Yes, I have tried this on many occasions but I have found my success limited. My experience has shown me that I must concentrate on one method when I am on the water and hunt for the feeding salmon. Depth of water is one of the more important factors to consider when drift fishing. Make a point to learn how far your lure is under the boat at ALL times. 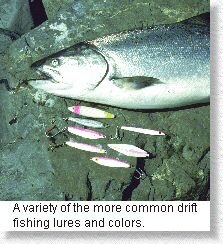 Salmon feed at select depths and you must find this depth and stay with it if you are to be consistently successful while drift fishing. There is one added advantage to saltwater drift fishing. It is highly successful for catching all forms of groundfish including halibut and rockfish. 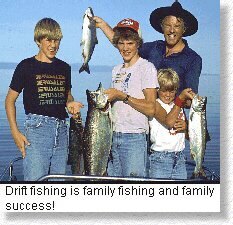 Try drift fishing - I know you will be glad that you did.